This ceramic base Clamp Lamp fixture is ideal for use with all types of incandescent lamps or Ceramic Heat Emitters. This Clamp Lamp fixture has a heat-resistant porcelain socket that handles up to 250 watts. The wire guard is safer than an aluminum reflector because it prevents unnecessary heat build up and possible hand burns. 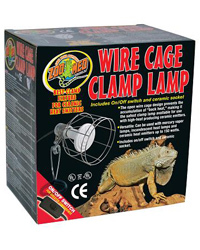 The only Zoo Med Clamp Lamp fixture that is U.L. approved when used in conjunction with Zoo Med's Ceramic Heat Emitter.